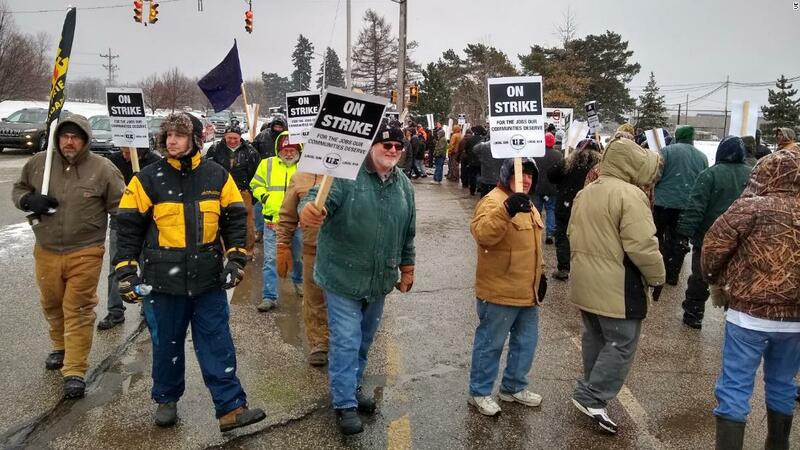 Feb 26, 2019 – Nearly 1,700 workers at a GE Transportation plant in Erie, Pennsylvania, went on strike Tuesday, marking the first large-scale work stoppage in the U.S. manufacturing sector in three years. Union members with the United Electrical, Radio and Machine Workers of America (UE) say the factory’s incoming owner, Pennsylvania-based Wabtec Corp., is trying to impose mandatory overtime, a lower pay scale for new employees, and the use of temporary workers in the facility. Wabtec just closed an $11 billion deal to merge with GE’s transportation division, which includes the Erie plant where locals have built locomotives for decades. Workers authorized the union to wage a strike after they failed to secure an interim agreement with Wabtec extending the terms of their contract with GE. As the new employer at the plant, Wabtec is obligated to recognize the union but has the freedom to negotiate its own new contract. 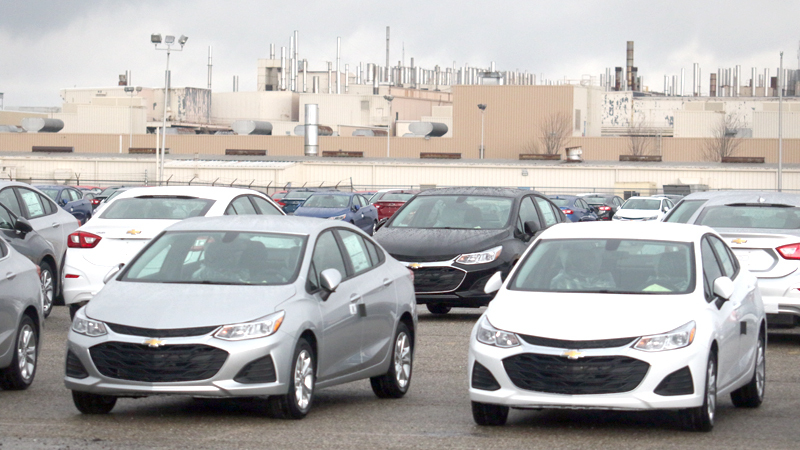 Union members felt they needed to go on strike in order to protect the middle-class wages and high working standards inside the facility, where pay averages around $35 an hour, said Jonathan Kissam, a union spokesman. He added that many workers already volunteer for overtime work but don’t want it to be mandatory, fearing it could ruin weekends with their families. He also said introducing lower pay for new hires would create a two-tier system inside the plant, causing rifts between different generations of employees. March 23, 2017 -BEAVER — About 75 union supporters rallied at noon Thursday in front of the Beaver County Courthouse to rail against legislation they say moves Pennsylvania toward becoming a right-to-work state. The legislation, Senate Bill 166, is called the Public Employee Protection Act, and it recently passed the state Senate. "I like to call it ‘paycheck deception,’" is how Steve Kochanowski of Potter Township described the legislation. 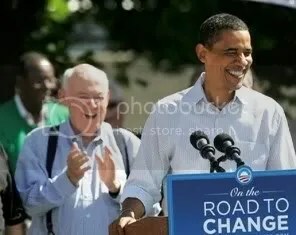 He’s on the executive board of the Beaver County Democratic Party and is active with its young Democrats group. Kochanowski, 32, is looking for a job now and is a former corporate trainer. He opposed the law because "I believe it’s the first step to trying to make Pennsylvania a right-to-work state," he said. 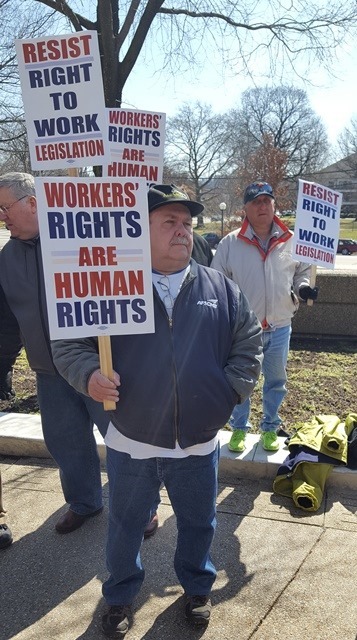 He and other Democratic leaders, along with Beaver County’s labor union leadership, organized the rally to marshal opposition to the law before it passes the state House. About 75 people turned out for the rally, wielding signs that said things such as "Workers’ Rights are Human Rights" and "Resist Right to Work Legislation." The legislation would "hurt everybody here," according to Mitch Kates, political director of the Pennsylvania Democratic Party. "We’re having organizing events like this all around the state," Kates said. "We want to help raise awareness." 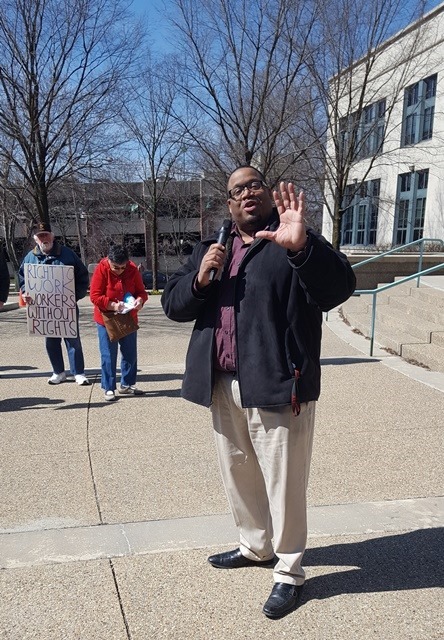 The law would prohibit unions from allowing payroll deductions for union dues that are used for political activities, and it’s a step toward stopping union members "from being able to donate to causes that are dear to your heart," Aliquippa Mayor Dwan Walker said. Walker is the son of a union worker and said his father appreciated that union dues were deducted from his paycheck. Otherwise, with other bills to pay, the dues might not get paid, Walker said. "These are matters of the heart," Walker said. "I stand for workers’ rights. You must resist." All of the speakers at the rally urged people to call their state legislators to voice opposition to the law. 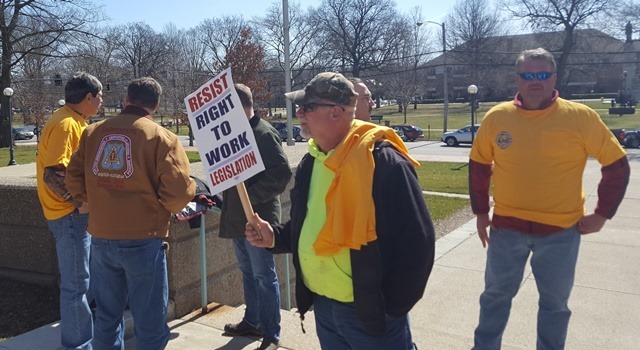 People who live in so-called right-to-work states, where union power is limited, make less money under worse conditions, Denise Cox of Ohioville said. She’s an organizer for the Service Employees International Union and said laws like the one proposed "weaken our workforce." "Government should … let us work together," Cox said. "(The law) is wrong for our future." She called it "big government’s intrusion into our workplace." PITTSBURGH — No 29, 2016 – Thousands of workers are walking off the job and marching Tuesday in cities across the country, including Pittsburgh, where morning protests will be followed by a larger downtown rally in the afternoon. The Service Employees International Union is targeting McDonald’s restaurants and UPMC with marches demanding a $15 minimum wage and union representation. 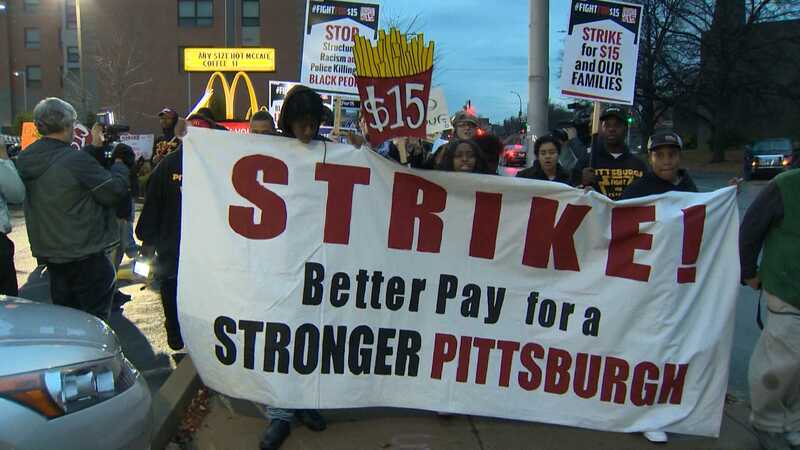 Organizers began their "Day of Disruption" marches at McDonald’s on Penn Avenue in East Liberty. Demonstrators went inside to voice their demands, then began circling the restaurant outside and chanting slogans like "Hold your burgers, hold your fries. We want wages supersized." "I want to be able to take care of my family, to take care of myself, to pay bills," McDonald’s employee Aaron McCollum said. "You can’t possibly do that on $7.25, $7.35 an hour." The protest then moved to a McDonald’s restaurant on North Euclid Avenue. "It’s about workers, but it’s also recognizing that workers are more than who they are in between when they clock in and clock out, but that they’re our community members, they’re our neighbors, they’re humans," said Kai Pang, an organizer with Pittsburgh United. "We should have the right to not only survive but thrive in this city." The group plans a similar protest near a McDonald’s and the federal building downtown during the evening rush hour. "I’m just trying to fight for something that I believe in," McCollum said. A press release on behalf of the group added, "Giant Eagle workers will also join the Fight for $15 today, asking that the company start paying family-sustaining wages and stop interfering with Giant Eagle employees’ right to organize." The union contends UPMC shuttle bus workers have also gone on strike seeking union representation. UPMC previously announced plans to increase the minimum starting wage for entry-level jobs at most of its facilities to $15 per hour by 2021. But the union says UPMC needs to move faster, and it accused the network of trying to silence workers and union organizers. UPMC hasn’t commented on Tuesday’s activity. "I think more now than ever that we’re standing up for worker’s rights, for economic justice at a time when income inequality is very high and only grows higher," said Pang. Faculty Organizing at the University of Pittsburgh: Why a Union, and Why Now? Oct 22, 2016 – There’s something in the air in Pittsburgh! From Robert Morris to Point Park, Steel City-area faculty are organizing to join the ranks of unionized labor. To some, this might be little surprise: Pittsburgh, is a city with a rich history of labor organizing. At the same time, when one thinks of Pittsburgh labor history they might think of workers smelting steel or armed Pinkertons at the Homestead steel mills. This isn’t entirely off base: in fact, Pittsburgh-area faculty are organizing with the help of the United Steel Workers including faculty at the University of Pittsburgh. But why unionization, and why now? There are many reasons, but three important ones are: 1) labor contingency and uncertainty worsens learning conditions, 2) teachers and researchers need a stronger voice in negotiations with administration, and 3) academic freedom is an increasingly valuable commodity in an age of emerging social consciousness about inequality. Focused, appropriately compensated teachers can do their best work,but one class of teachers, adjuncts, teach on a pay-per-class basis. Because the compensation for these classes is very low, adjuncts often teach at several different universities, and many must work other jobs. Moreover, these positions are renewed on an ad hoc basis, often with little lead time before classes start. One colleague of mine would teach two classes at Pitt a semester, a few more at Point Park, and also tended bar in the evening. The only job he could count on having come next semester was the gig tending bar. For many, teaching is a vocation chosen not for monetary benefit, but for the value of teaching itself. But running around town, barely making ends meet is not a recipe for the best teaching. The unpredictability wears both on the teachers —who struggle tol pay their bills—and students, who may be excited about particular instructors and their classes, only to scroll through the catalogue and see no hint of the instructors because they have not yet been renewed. For other, less-contingent faculty, increasing demands for service and research also eat into teaching time. Appropriately compensated faculty are more capable of directing time and effort into education.